For the month of September, please join us in our loose change challenge. It is very simple. Set your favorite coffee mug out in a convenient place and when you find you have loose change, put it in your mug. On the weekend of September 29/30, bring your mug to church and take pleasure in dumping it into a bucket with everyone else’s change. This will, of course, benefit the Squirrels’ Nest Reserve which comes in very handy to help us with unexpected expenses and helps us to stay on budget. 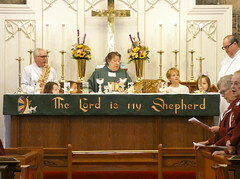 We are blessed to have each other here at the Church of the Good Shepherd. As Mother Susan reminds us, we are the Church. The Vestry is grateful for all of your trust and support as we work together to keep us moving forward. Together, we did something new this spring: we introduced the Squirrels’ Nest Reserve during the Spring Stewardship Campaign. Much gratitude to Claude Coulson and the Property Committee for creating the detailed spreadsheet predicting what we will need to periodically replace the big stuff: roof, boilers, AC, flooring, windows, etc. This inspired a collaborative effort that led to the Squirrels’ Nest Reserve. Keep in mind that unlike an endowment, this reserve fund will be continuously spent and replenished. More about that later. The Spring Stewardship Campaign was conceived in the spirit of ministry, mission, gratitude, and growth. We started after Easter with a BBQ to celebrate the new ministry of Deacon Carl Dunn. The following week we celebrated Mission and Ministry with moving and uplifting stories about some of our myriad ministries at Good Shepherd. The stories were of parishioners working as the hands and feet of God in the world. The theme of the third week was Many Gifts One Spirit. What better way to wrap up Spring Stewardship than a Sunday School celebration honoring everyone who gave their time and love to our young parishioners? Truly the Holy Spirit at work among us! We are blessed! The outcome of the Spring Stewardship Campaign reflects the generosity and love of our congregation. In our recent Spring Stewardship Campaign for FY2018 there were 42 pledges. Of these, 8 were new and 7 represented an increase. The net change relative to last year for these 42 pledges was +$12K. That’s awesome! Some folks moved their pledge from fall to spring. Some pledged last spring and did not pledge this spring. 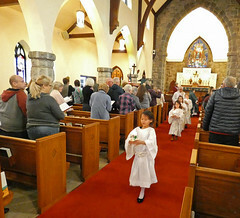 We are blessed with new members at Good Shepherd who made new pledges, and there were others who pledged anew this spring … just about every possibility occurred. 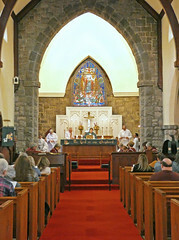 Many parishioners prefer to wait until fall to pledge, as this is the traditional time in the Episcopal church to make a commitment for the upcoming year. We will continue to provide this opportunity during our Fall Stewardship Campaign. Something else to look forward to: a spotlight on growth. We recognize our growth as a parish as stewardship of our greatest gift: each other! The children of God. The people of our community and beyond. Regarding the Squirrels’ Nest Reserve, George Funk is still counting coins. Keep them coming! Good Shepherd is blessed, we are blessed. Thank you all and praise God for our blessings! As the fall season approaches, there are exciting times coming at Good Shepherd with the beginning of a new year for Sunday School, the return of the choir, the start of Confirmation Classes and all of our ministries resuming a full schedule. Before you know it, the leaves will be falling, and we will be preparing for several events – Crop Walk, Holly Fair, Christmas Pageant, Bishop’s Visitation… It is just an awesome time of anticipation to serve and celebrate our Lord! This year is particularly special, in that our Discernment Committee – who has been working very diligently all summer – is getting ever closer to presenting a Rector Candidate to the Vestry. This past late-Spring, the Stewardship Committee did something unprecedented in the Diocese of New Jersey, and held the Annual Stewardship Campaign early in the year. The themed Temple Talks of “It’s God’s Money”, “Stewardship is not fund Raising”, and “First-Fruits Giving”, were well received by many. We received responses from several who had never pledged before, and many others who prayerfully increased their annual giving to our church. However, there were also many regular givers that, for whatever reason, did not respond during the Transformational Stewardship campaign. The Vestry and Stewardship Committee received about 20 responses from the survey that was conducted in August, and each response was read and discussed in the Vestry Meeting – We thank you for that feedback. Stewardship is not about fund raising, however, the Vestry has an obligation, both to the Parish and to the Diocese, to develop a realistic and responsible budget (a bit earlier than usual this year) as part of preparing for the Presentation of Candidates by the Discernment Committee. For this purpose, the Vestry and Stewardship Committee are called to hold an additional “Mini-Campaign”, during services on October 3-4, giving those parish members that have not yet provided an Estimate of Giving (Pledge Card) another opportunity to do so. If you have already turned in an Estimate of Giving card either during or following the spring campaign – Thank You! But if you have not done so, we ask that you prayerfully consider providing an estimate of your offering to the church for 2016, and return the enclosed Estimate of Giving Pledge Card either in the offering plate at services during the weekends of October 3-4 and October 10-11, or to the Parish Office by October 12th. Check out this YouTube video that explains more about transformational stewardship: My Money.